After starting my very first pigs in the bottom half of the Woodshed, our subsequent pigs have moved around a bit. First they moved to the polebarn, then they got a nice spot made up for them in the big barn. But now, for the first time, we have the need for 2 separate places to raise different age-groups of pigs. 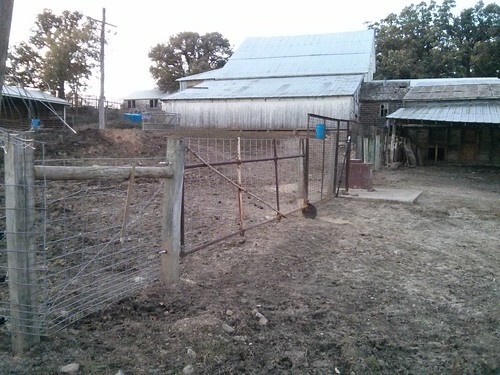 Back when we replaced the waterer, we had to pull out and then replace almost all of the heavy-duty lot fence that separates our two pig (and cow) living areas. That fence is now very capable of holding any cow or pig. Plus we added two working gates, a 14′ gate for vehicles & equipment and a 3′ gate for people to walk through. While the fence was out we took the opportunity to address some of the really dumb drainage problems. We spent a couple of days getting the contours right with the tractors bucket and rear blade. 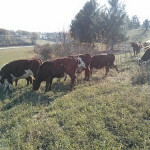 The bare dirt was then seeded in a mix of pasture grasses and legumes with oats as a quick cover. As we get time we’re even spreading some old hay from the hayloft down as a mulch. We got the fence reconstructed just in time for our final batch (hopefully ever?) of feeder pigs to arrive. Feeder pigs are generally young 1.5 to 2 month old pigs that we buy to then grow out to their market weight at about 5-8 months. In a few months we should have baby pigs of our own, so we can quit buying feeders from someone else. You pretty much have three options for buying feeder pigs around here, none of which are good. You have the “know a guy” option, but being new here, I don’t know any guys with spare pigs. 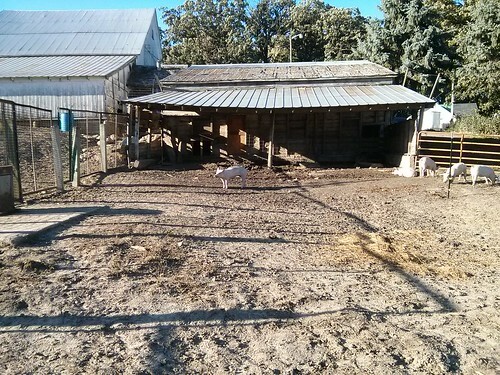 Craigslist is #2 but almost never has feeder pigs, when they do, it’s often someone selling sick barn-raised pigs. The third and most reliable option is the weekly feeder pig auction at Zumbrota’s Central Livestock Association. The auction always has pigs for sale (between 400 and 700 per week usually) and at least you can see them in the ring (and see any shots they’ve had on the screen) before you buy them. The downside is that you can always assume that the pigs you’re getting were from a “conventional” pig farm. Assume they were raised indoors, on concrete with limited fresh air and no sunshine. Unless I know otherwise, I always assume that a feeder pig (especially from an auction) has ZERO experience with electric fencing. For a while they get a pretty small area that’s fenced with a small run of two aluminum hot-wires. 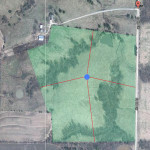 The area isn’t very big, but it gets them to respect the electric fence in a hurry. Plus, for the first week or so, indoor-raised pigs just don’t know what to do with themselves outdoors. They tend to stay by the building, a bit overwhelmed by the great outdoors, only venturing out for food and water. 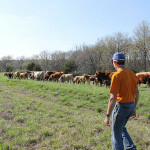 At the end of the first week, it’s time to take the fence down and let them roam around more. 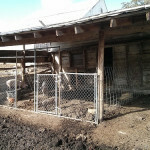 This time after remembering something from a video of Joel Salatin’s pig operation, I put up a cattle panel as part of their initial fence. 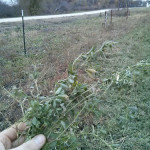 I took down the cattle panel and the electric fence at the same time. 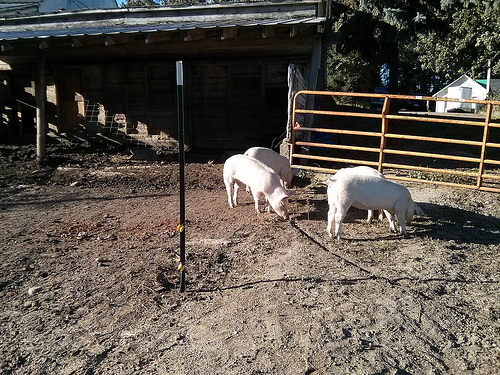 Within a few moments the pigs figured out that they were free to explore where the cattle panel had been taken down. But it took them hours to actually believe that the electric wires were gone. If you’ve ever been shocked by a high-powered fencer, then you might understand their abundance of caution. 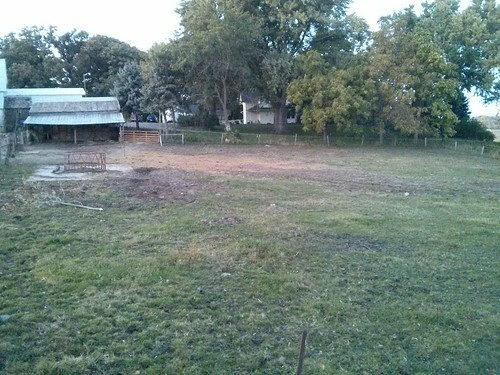 The feeder pigs now have a whole paddock all to themselves! Day by day they venture out further into the paddock. Within a few days they’ll be brave enough to get to the other corner, where the crabapple tree awaits with oodles of windfallen treats. If they knew about the apples, there would be a race to get there, but I haven’t let them in on the secret yet.